In his article "OPT2 Yagis", Rainer DJ9BV describes a series of yagis developed by computer optimisation. They feature high gain, good polar diagrams and near 50ohm impedance. The article is published in "Dubus Technik V". 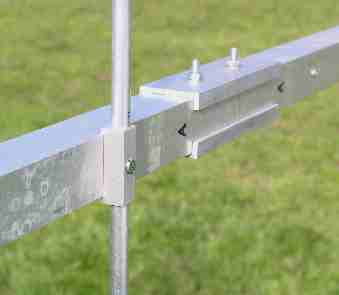 The smallest 2m yagi that Rainer describes is 2 wavelengths long, and turned out to be just what I was after in terms of performance. However Rainer has no designs for 4m, so I have scaled the dimensions, applied correction factors where necessary, and checked the results using "Yagi Optimiser". The result is a 4m beam with more than 12dBd gain and a front to back ratio which exceeds 20dB. I have been encouraged to publish the dimensions here, and it can be copied but remember that the basic design belongs to DJ9BV. My construction is light-weight, and is designed for portable use, with frequent assembly and breaking down in mind. Boom is 1-1/4 inch square section, 16g. The elements are mounted directly above the boom and in electrical contact with it. 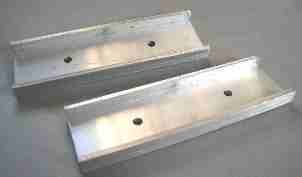 The mounting blocks are machined from solid aluminium. The boom is in 4 sections of approximately 2m length each. 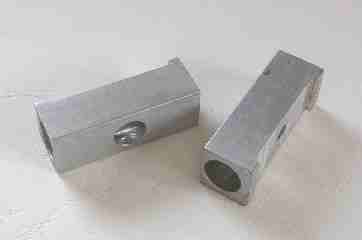 Boom joiners are machined from 1-1/2 inch channel. There are two things to note about the boom joiners. 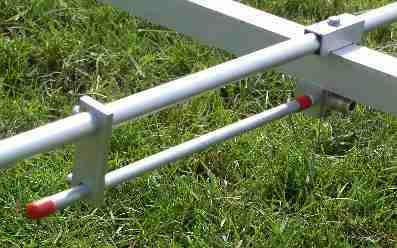 Firstly they cannot be in the same position as an element mount, and secondly, the middle joiner also functions as a mast clamp point. It needs to be located slightly nearer to the rear of the antenna so that balance is achieved. Element fittings use M4 bolts, and the boom to boom clamps use M5. The fitting to the mast uses conventional pipe clamps, M8 size. The boom is too flexible without a means of support. A synthetic rope is used to "hang" the boom from a central support point a couple of feet above the boom to mast clamp. The aerial is designed to be near 50 ohms impedance, which means that either a split dipole can be used, or a folded dipole with a 4 to 1 balun. For simplicity at present I have opted for a gamma match feed, so it is not of concern if the actual impedance is a little different. The gamma match is a one-off for this project and is not described further. 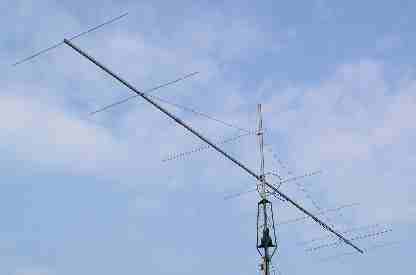 The aerial pattern diagrams are derived from YO v6.53 (Yagi Optimiser from K6STI). The freqency range plot shows that the aerial has a classic current distribution pattern. While the HF plot begins to display the characteristic 'long plumed tail' of a 'pushed', narrow band design there remains a well-formed set of rear lobes well beyond the band edge. The pattern does not significantly degrade until the frequency approaches 80MHz - more than adequate for the available 4M spectrum - and capable of maintaining performance in damp conditions and falling rain. The polar plot is calibrated in dBd and displays the pattern at the band SSB centre frequency. The pattern is both clean and symetrical; exhibiting, in practice, no discernable 'squint' when fed with a simple gamma match. -3dB beamwidth is 2x18°. Modelling a stacked pair at .9 λ realises over 15dB of forward gain with the first major side lobes just over 20 dB down and positioned exactly ± 30° with a deep null. The major rear lobe remains approx -25dB while the rear side lobes are significantly reduced, below -30dB.